The 100 mm WEMPE quartz clock of the PILOT V Series presents itself timelessly beautiful. The simplified design with the elegant stainless steel casing upgrades every interior. The time of day is shown on a white dial with a diametre of 85 mm. Hands and Arabic numbers are kept grey in colour. 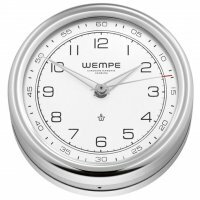 The WEMPE Ships' bell clock PILOT V is operated by battery-powered quartz movement and represents 110 years of quality craftsmanship from Germany in an elegant manner. 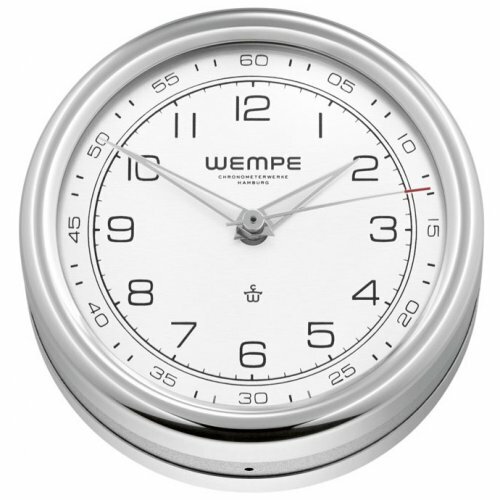 WEMPE Clocks are appreciated by sailors and ship owners all over the world and can also be found as decorative instruments in many offices.